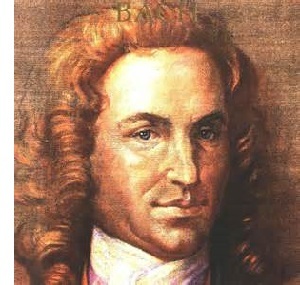 Johann Sebastian Bach (1685-1750) - Johann Sebastian Bach is both one of the earliest and greatest composers of Classical music in history. Today we consider just about any music at least a century old to be categorized as Classical. Technically, though, this very early period is a branch of Classical music known as Baroque; and Bach is the most recognizable composer of the Baroque period (Vivaldi probably being a close second). The Baroque era lasted from about 1600 to 1750 and is most widely characterized by the use of counterpoint. The simplest definition of counterpoint is presence of two independent lines of music being performed simultaneously. Bach was born into a musical family (his father and uncles were all musicians) so his career path was pretty much set from birth (his brother was a composer as well). His most famous works are his six Brandenburg Concertos. He also wrote some 200 cantatas, which involves singing (usually by a choir). The keyboard, specifically the organ and harpsichord, was his preferred instrument for which to compose music. Interestingly, Bach was not generally considered a master composer within his own lifetime, or immediately following his death. But a generation after his death, he gained admirers from the likes of Mozart and Beethoven (not a bad fan base), and his legacy began to climb considerably.